I’ve walked to Sant Jaume along the narrow streets of the ciutat vella, the old city. At practically every corner, it seems, is a plaza, a medieval building, or a row of elegant, neo-classical facades. This is one of Europe’s largest and best-preserved historic centres; it can take days to explore it all. And after you’ve done that, there are still the many modern neighbourhoods to see, with their shops, museums, concert halls, parks and chic apartment buildings. Valencia’s climate is famously mild. During the hottest months of July and August the temperature hovers in the upper 20s C, daytime winter temperatures average in the mid-teens. It’s just like Australia, without the extremes. Valencia lies smack in the middle of Spain’s Mediterranean coastline, just over 320 kilometres south of Barcelona and about 130 kilometres north of Alicante. It also has long stretches of beach right in the city—you can take a bus or the train there. Seaside restaurants and small hotels line the beachfront, and palm trees are everywhere. The city is also very green. There are numerous parks. A great swath of greenway runs from northwest to southeast, in a long curve right through the middle of the city, all the way to the sea. Called the Turia Garden, it’s home to green meadows, giant shade trees, walking and bicycle paths, and kiddie gardens. Right along the Turia Garden are some of the city’s most pleasant neighbourhoods. They’re attractive, upscale and well-served by public transportation. 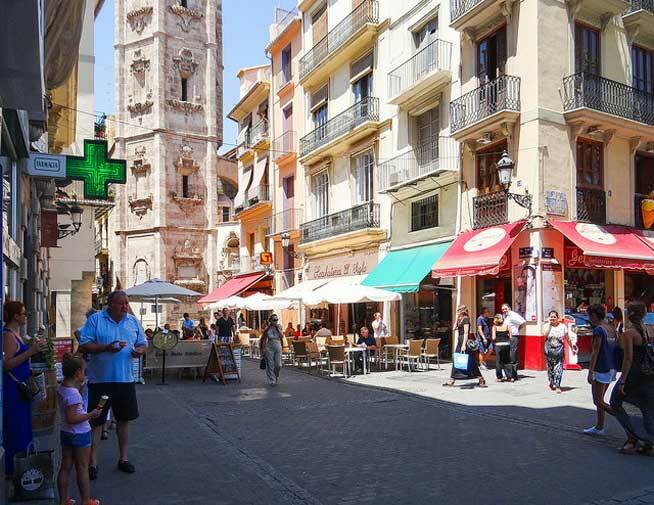 Valencia’s historic centre, the ciutat vella (as it’s called in Valenciano), is only a five-minute walk from the Turia Garden and is practically a city-within-a-city. It’s filled with narrow, cobbled streets, some medieval Christian towers and monuments, the 13th-century cathedral and remains of Moorish walls, all reminders of Valencia’s 2,000-year-old history. But it’s hardly a relic. It’s crisscrossed with a few broad, modern streets that house shops on the ground floor, and most ordinary buildings look 19th century or later. A three-bedroom, two-bathroom apartment here, in the La Xerea neighbourhood, with two balconies overlooking the street and about 100 square metres of living space, was on sale for €190,000—about $267,000—when I was there. Due east of the ciutat vella, across the Turia Garden, is a district known as Pla del Real. The layout is typical of upscale Spanish neighbourhoods: Streets are wide, with broad sidewalks on each side, lending an open, airy feel. Most buildings are mid-rise—perhaps eight to 10 storeys. Shops are on the ground floor and balconied apartments above. I saw a range of shops here: Clothing boutiques, green grocers, outdoor cafes and the university is walking distance away. There are two metro (train) stops nearby, and convenient bus services. What I particularly like about this neighbourhood is its park space. The Turia Garden forms its southern border and a large park called the Royal Gardens lies to the west. (Valencia’s Fine Arts Museum anchors the Royal Gardens, so you’re steps away from it.) Many apartments in this area are three-bedroom, with sizes for two- to three-bedroom units starting at around 65 square metres. Sale prices for apartments start at about €85,000 (that’s $131,000), though you should generally expect to pay in the low €100,000s and up. The district of Extramurs—literally “outside the walls”—lies south of the ciutat vella and just west of the Renfe train tracks and stations. Toss aside any preconceptions about grubby train-station neighbourhoods: Extramurs is surprisingly pleasant and upscale, with some broad boulevards, smaller streets, and plenty of shops and residences. You can find small, renovated one- and two-bedroom apartments in this area selling for as little as €60,000 to €75,000 ($92,400 to $115,500), but they’ll be in buildings without lifts. For those prices you may be willing to forego the green spaces and buy a plant (for your balcony with a view) instead.